Am I purple er lilac? What color am I? I’ll ask Shepherd. Ryan, despite his brown fleece, is not a lilac. 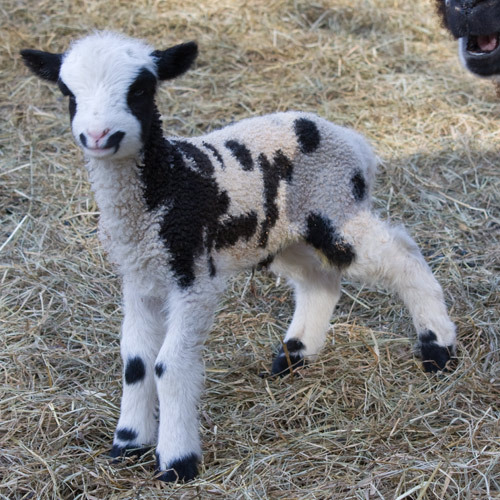 As a lamb..
his facial and leg markings and body spots were black. Unlike Damsel, who is a true lilac..
Damsel was an obvious lilac from birth. The lilacs that I’ve seen have very often had body color and leg markings that looked darker at birth and took a bit to turn a more obvious chocolate or blue. The facial markings have been there at birth. It may not be apparent in this photo, but Damsel’s body spots are subtly different from black. At birth, her ankles were close enough to black that I wouldn’t have been able to classify her color if that’s all I was seeing. She is easily recognized as a lilac now. So what is Ryan? His small bit of muzzle patch is black. He has no eye ring (but some spooky blue eyes!). His fleece looks brown~~~~~He’s sun bleached~~~~I don’t know if you see this in other parts of the country, but around here, it’s not unusual to see sun bleached brown tips on black fleece. The fleece below the tips and the skin color remains black . Sun bleached fleeces, at least here, are not weak or brittle. From what I’ve observed, the tendency to sun bleach is heritable, much like graying or roaning. 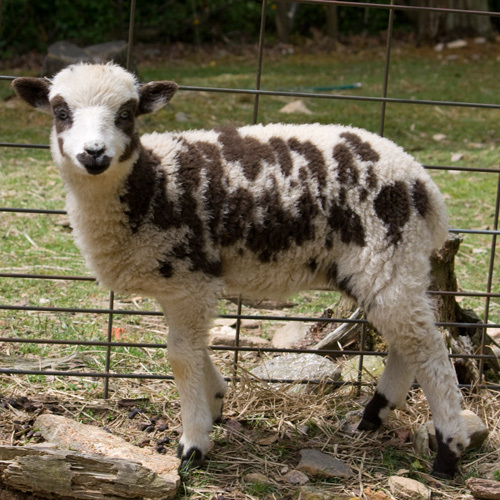 It’s unusual to see a lamb that has sun bleached to this extent. I wonder if there is a correlation between the pale blue eyes and the reaction to the sun? Just musing. 4 Responses to What color am I? 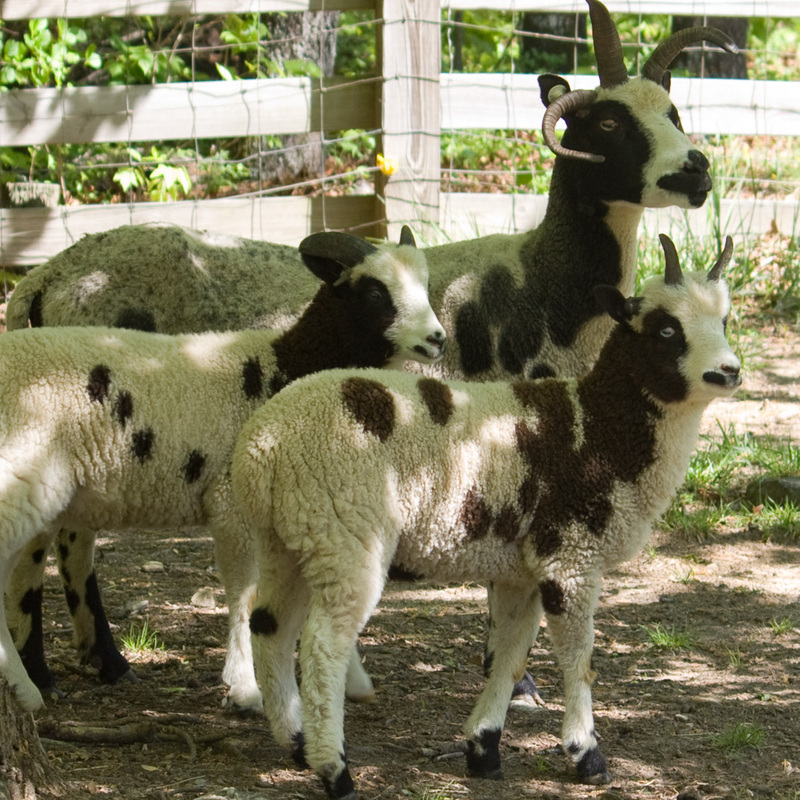 I would like to add a lilac to our flock if you (or someone you know and can recommend) ever have one – ewe or wether. Must have a good fleece…not just a cull. I think no matter what you call him – he sure is adorable. Too bad I don’t live MUCH closer – I’d take Patrice’s little foster off her hands in a heartbeat. I’m just loving those cheeky dimple spots. Long time, no lunches. At this rate your lambs will be yearlings before I see them! 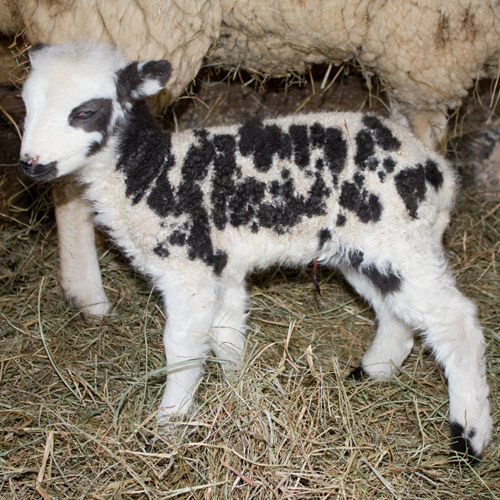 Now I’m doing the Census – so’s who knows when I can go a’lambing. 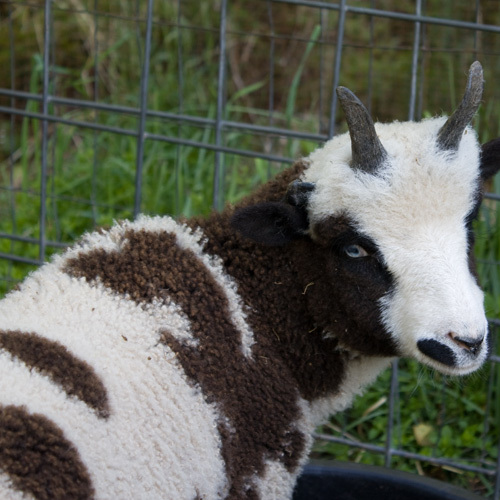 by the by… I’m fostering a nanny goat that was removed from an abusive situation. 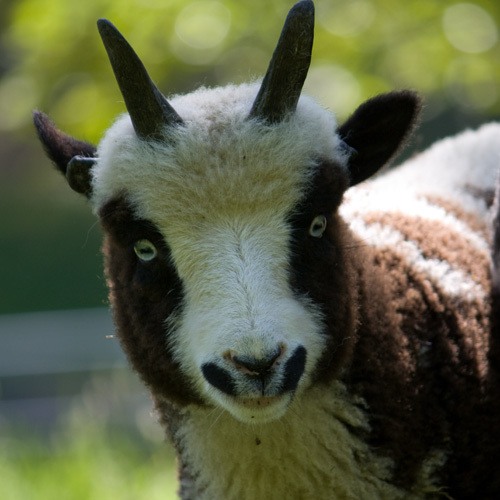 She’s Toggenburg/Nigerian X, 5 years old, very tame and leash “trained.” ( I think she just likes to walk along with folks…) She needs a home with other goats, so if you hear of anyone who wants her, she’s available totally free of charge.